There are thousands of different types of spiders in the United States, but the varieties you are most likely to encounter indoors are generally not dangerous – and when spiders do bite, it’s relatively rare. Only a small number of species, including the black widow and brown recluse, are capable of piercing human skin. Web-building spiders, like black widows, wait for food to come to them. They are adept at surviving and reproducing indoors. Hunting spiders, like wolf spiders, are quicker and have better eyesight to aid in chasing and capturing prey. They live outdoors primarily, finding their way inside in cool weather, but don’t typically reproduce indoors. 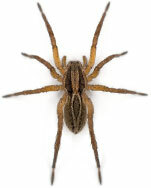 If you have problems with other types of insects, you’re more likely to see spiders in your home. Closing insect entry points will help keep spiders out. Check seals and weather stripping around doors and windows and caulk any openings you might find. Remove outdoor woodpiles and cut back climbing vines and overgrown shrubs around your house so spiders can’t use them to access your home. Remove any visible webbing outside and inside, especially around windows and in corners. Be careful in places black widow, brown recluse or hobo spiders are known to infest Seek immediate medical attention if bitten by a spider.